“Easter Eisteddfod for Welsh Division” announced the Bedfordshire Times and Independent of 14 April 1916. 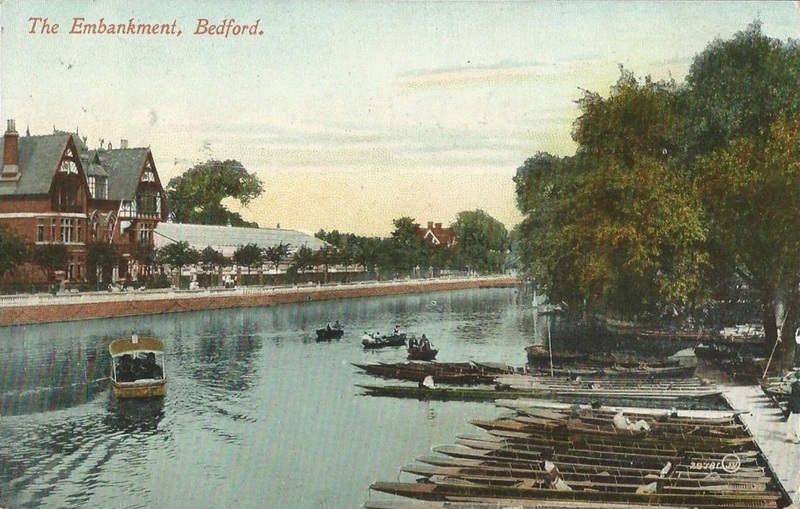 For the Scots, Highland Games, for the Welsh, an Eisteddfod, it said, and recounted that the previous Easter Monday’s Highland Games would be remembered in Bedford as long and as pleasantly as the Scottish invasion. The Borough Recreation Committee, this Easter, mindful of the Welsh inborn love of music and their national institution, the Eisteddfod, were marking their stay in Bedford with an Eisteddfod on Easter Monday, 24 April. It was to be held in the Skating Rink* on the Embankment. There were 25 competitions programmed to last five and a half hours without an interval. Due to the large number of entries preliminary competitions were held, with the top three in each event going forward to the finals on Easter Monday. The Eisteddfod opened with competitions for drums and bugles, followed by trumpets and mouth-organs. Only two competitors entered the stringed instrument class, the winner playing a dulcimer. There were singing events both choral and solo, impromptu speech (on subjects including mothers-in-law, billets in empty houses, Zeppelins and mud), and recitation (own selection, a test piece – “The Day”, and humorous verse). The writing of a piece of poetry on “A Soldier’s Life” was necessary to qualify for the bardic chair. 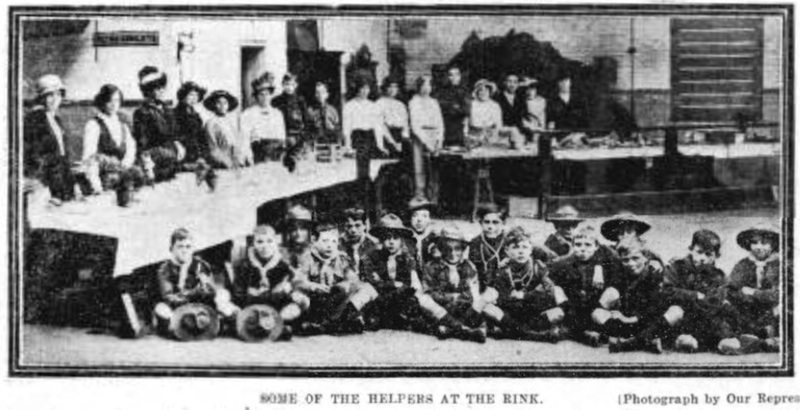 Separate events were arranged for civilians, including one for choir boys. The competitions were followed by the chairing of the bard and the presentation of prizes. 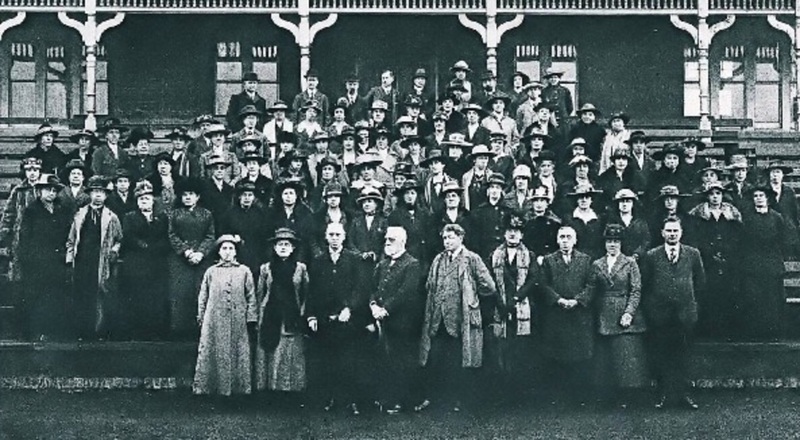 In its 28 April edition, ‘The Eisteddfod: Full List of Awards: The Prize Poem and the chairing of the Bard: some of the impromptu speeches’, the paper included a full report on the Eisteddfod and photographs of the Easter Monday event. 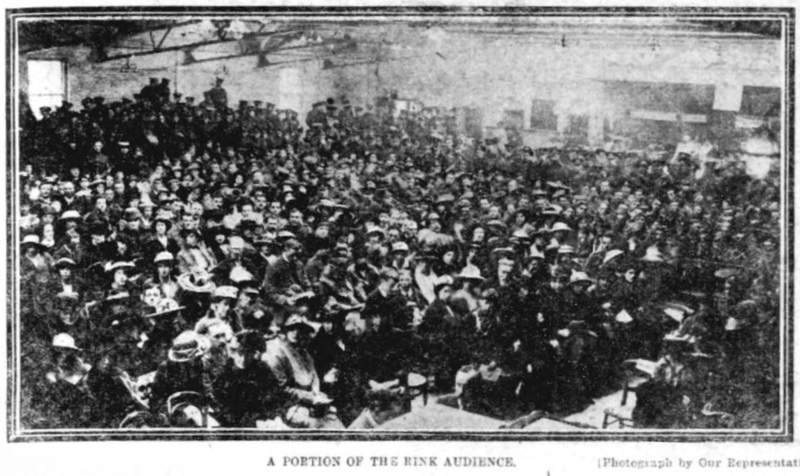 It recounted that the large number of Bedfordians and soldiers who gathered in the Skating Rink were treated to a program of great variety and considerable length and saw a splendid exhibition of the musical ability which to the Welsh is almost an instinct, and were full of admiration of the talent displayed. The Welsh soldiers, of whom there were still many thousands at Bedford, had a rare old time on Easter Monday, Llais Lafur – Labour Voice of 6 May 1916 recorded. 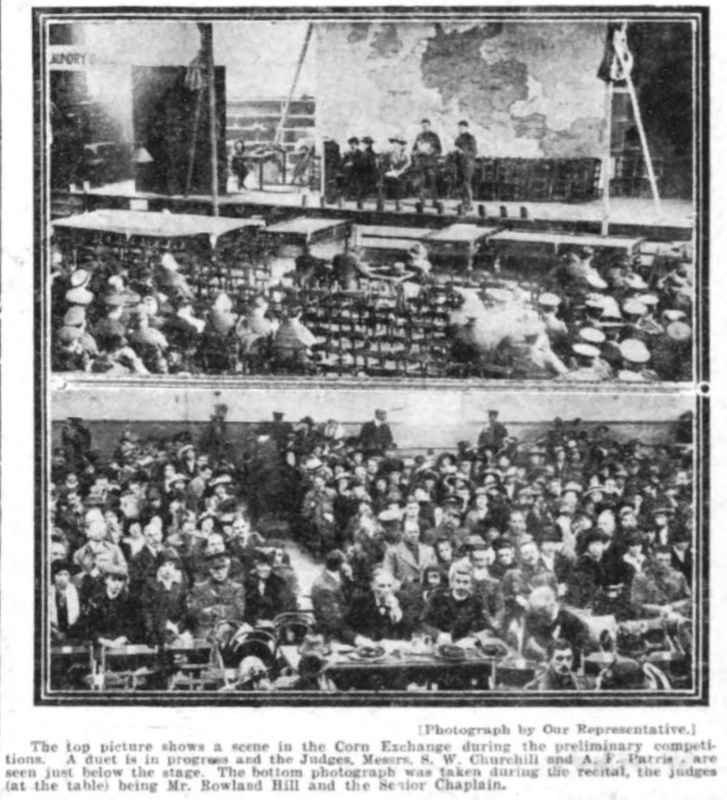 An Eisteddfod on an ambitious scale took place at the Skating Rink, among the adjudicators being Major-General Reade CB, and Dr Walford Davies. A good many South Walians occupied prominent positions. 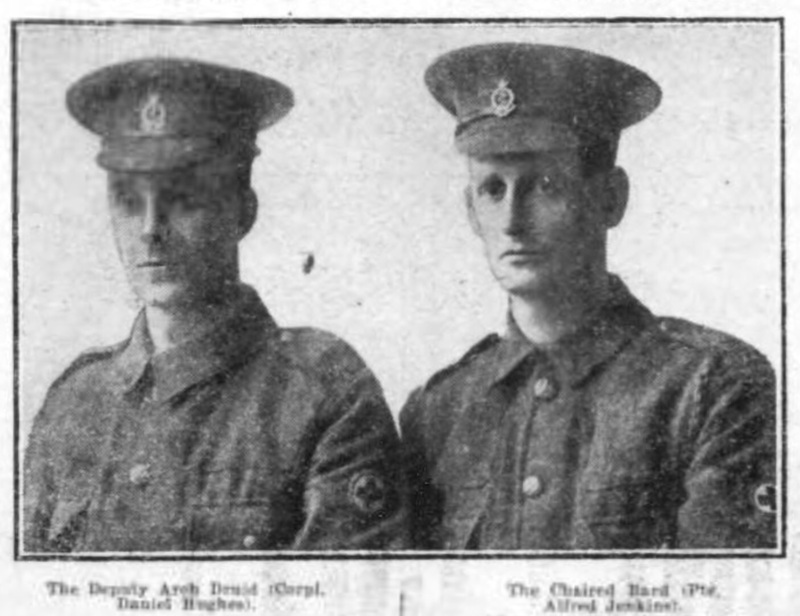 For instance, Corporal Daniel Hughes, Baptist minister at Pontypool, deputised the Archdruid, Private Alf Jenkins, Presbyterian minister, Pencoed, was the chaired bard. 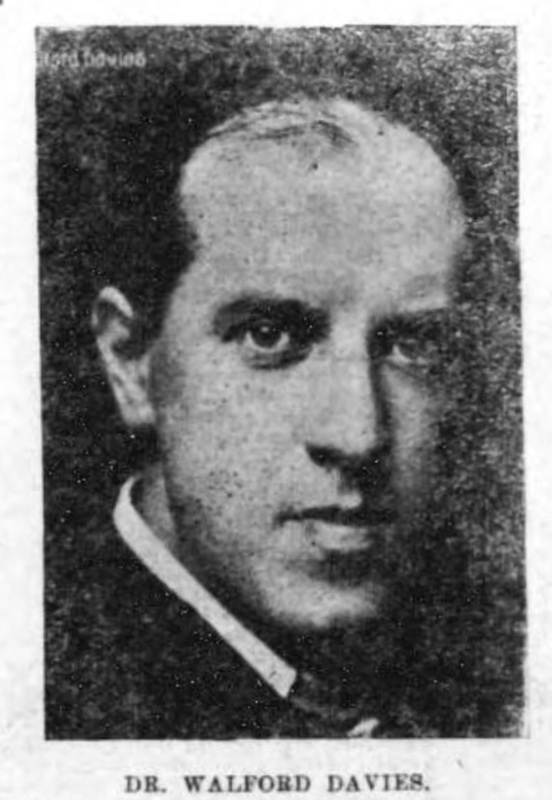 The Glamorgan Gazette of 12 May 1916 was pleased to report the success at an eisteddfod held in Bedford of Private Alfred Jenkins BA from Ardwyn. Private Jenkins won the chair at the eisteddfod for a poem on “A Soldier’s Life“. The Bedfordshire Times and Independent in a five column report of the eisteddfod spoke, the Gazette recorded, of the chairing of the bard as the most impressive part of the day’s proceedings. Corporal the Rev Daniel Hughes WCCS, Deputy Arch-Druid of the Isle of Britain, acted as the master of ceremonies. The Bedfordshire Times paid the young poet the compliment of printing his portrait and giving copious extracts from his poem. Private Jenkins was a graduate of the Welsh University and was serving in the Royal Army Medical Corps. It spoke well, the Gazette said, for the interest taken by Bedfordians in the Welsh troops stationed in their town that the eisteddfod was promoted by the Borough Recreation Committee, that the luncheon was attended by a large audience of townspeople and soldiers who have given, to quote the Bedfordshire Times, a splendid exhibition of the musical ability which in the Welsh is almost an instinct, and were full of admiration of the talent displayed. 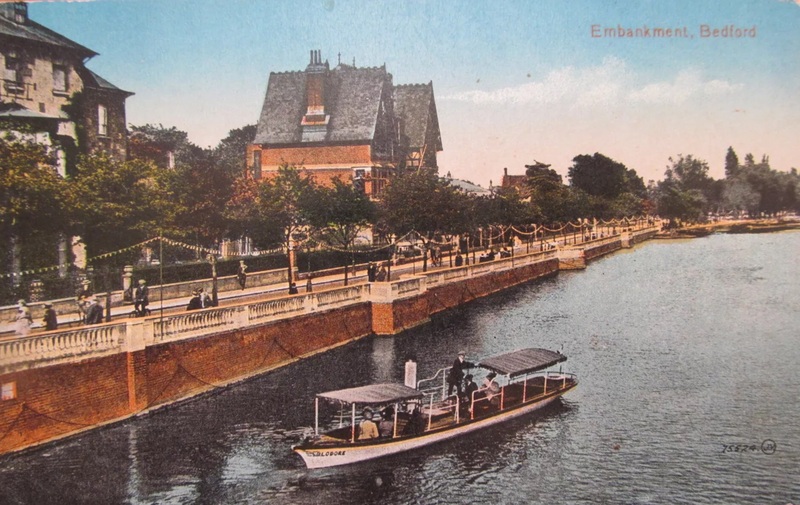 * The indoor roller skating rink for 3,000, designed by local architect E H C Inskip and opened in 1909, was situated on the Embankment past the Swan Hotel (in the picture above, the hotel is the building on the left and the skating rink is to the right of the tall brick building in the centre, as can be seen in the picture below and at the head of this page). Subsequently, the popularity of roller skating waned and towards the end of 1919 the building was divided in two to become Murkett’s Garage and a café dansant. It was rebuilt and opened in 1929 as a classically fronted cinema, The Plaza, by another local architect Ivan Daughtry, which after other names and uses over the years was eventually demolished in the 1980s.